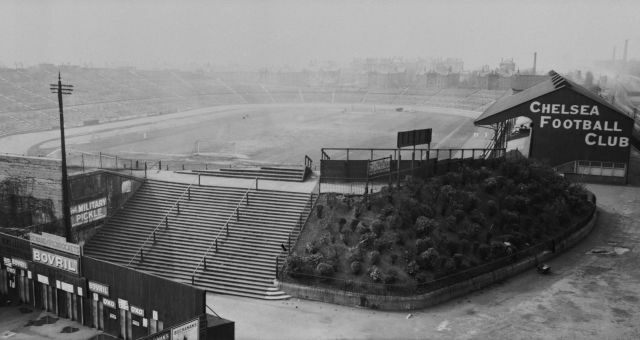 Chelsea played their first ever game at Stamford Bridge on 4th September, 1905 – a 4-0 win over Liverpool in a friendly. The game came two days after the club’s league debut away at Stockport County. The Blues lost that one 1-0. Stamford Bridge stadium actually formally opened in 1877 and was home to the London Athletic Club. In 1898 it hosted the World Championship of shinty – it’s a bit like hockey or hurling – between Beauly Shinty Club and London Camanachd. The stadium, designed by noted football architect Archibald Leitch, was originally offered to Fulham, but they couldn’t raise the finances. In 1904, the lease was bought by brothers Gus and Joseph Mears, and they founded Chelsea Football Club so that they could stage professional football matches at the ground. The ground’s official capacity in those early days was 100,000, which made the stadium the second largest in England after Crystal Palace. As such it was even used as an FA Cup Final venue from 1920-1922. These days, the Bridge’s capacity has been scaled down to a relatively meagre 41,798, making it the eighth largest ground in the Premier League. The picture above shows the ground staging the 1921 final. 1905? ?… That can’t be right – do you mean 2005?… (Abramovich wasn’t around in 1905 you pillock). @moanrinho: Lol,top trolling. Almost thought you were being genuine there!lol. Shame on me. There was football before the premier league?